Product #17312 | SKU 9000298 | 0.0 (no ratings yet) Thanks for your rating! Being tough is one thing, but the Rugged Mini is also a true performer. 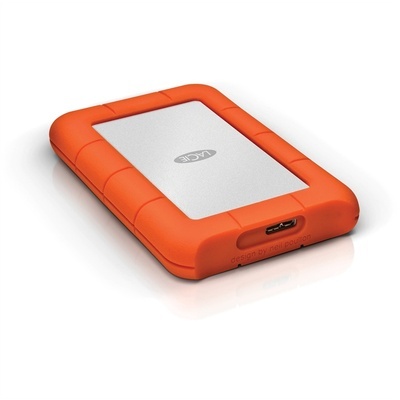 The drive features a USB 3.0 interface - which is also USB 2.0 compliant - and a transfer rate of up to 5Gb/s. When it comes to RPMs, the drive functions at 5400 rotations per minute. Beyond speed, the Rugged Mini has security on its agenda. The LaCie Private-Public software that comes built-into the drive ensures that you can keep private files private with the help of a password protected section of the drive. Additional features like Automatic Backup and 10GB of free storage on Wuala's Online Storage also give you peace-of-mind when it comes to your data.